The SL-PS Series of power supplies provides a reliable DC power source for any industrial control system. These economical and reliable power supplies for industrial devices (PLCs, sensors, switches) are designed to take minimal space in your electrical control cabinet. 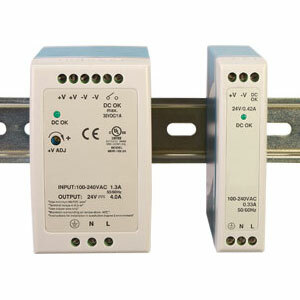 The SL-PS Series of power supplies offer short-circuit, over-load and over-voltage protection. These high quality power supplies have passed a 100% full load burn-in test, and are UL/CUL listed and CE marked and are NEC class 2 compliant. Slim 24 Vdc power supply, 10W, 0.42 Amp with DC OK active signal. Slim 24 Vdc power supply, 20W, 1 Amp with DC OK active signal. Slim 24 Vdc power supply, 40W, 1.7 Amp with DC OK relay contact. Slim 24 Vdc power supply, 60W, 2.5 Amp with DC OK relay contact. Slim 24 Vdc power supply, 100 W, 4 Amp with DC OK relay contact. Slim 12 Vdc power supply, 20W, 1.67 Amp with DC OK active signal. Slim 12 Vdc power supply, 40W, 3.33 Amp with DC OK relay contact. Slim 12 Vdc power supply, 60W, 5 Amp with DC OK relay contact. Slim 12 Vdc power supply, 100 W, 8 Amp with DC OK relay contact. Slim 5 Vdc power supply, 20W, 3 Amp with DC OK active signal. Slim 5 Vdc power supply, 40W, 6 Amp with DC OK relay contact. Slim 5 Vdc power supply, 60W, 10 Amp with DC OK relay contact. Slim 48 Vdc power supply, 40W, 0.83 Amp with DC OK relay contact. Slim 48 Vdc power supply, 60W, 1.25 Amp with DC OK relay contact. Slim 48 Vdc power supply, 100 W, 2 Amp with DC OK relay contact.